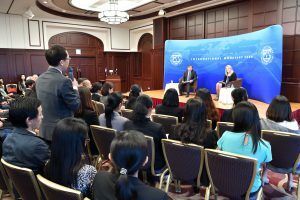 GraSPP students supported by the JISPA (Japan-IMF Scholarship Program for Asia) participated in a Town Hall Meeting with the IMF’s Deputy Managing Director Madame Carla Grasso on December 3, 2018. 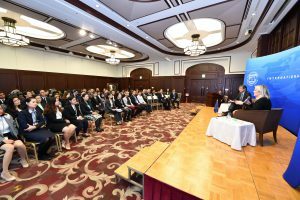 The Meeting was organized in Tokyo by the IMF Regional Office for Asia and the Pacific (OAP) for a dialogue between Madame Carla Grasso and about 50 JISPA scholars. Mme. 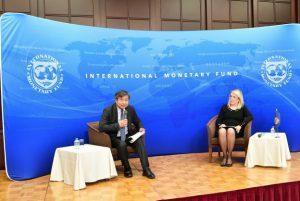 Grasso oversees capacity development activities of the IMF, one of the three pillars of its operations, through which the IMF shares its knowledge with member countries and works with them to build effective policies and institutions. In addition, Mme. Grasso is also responsible for all administrative functions of the IMF, including its budget, human resources, technology, general services, and internal audit. 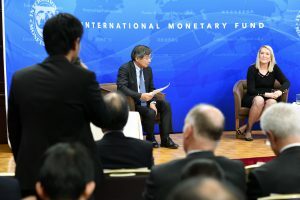 She visited Japan to strengthen the IMF’s capacity development efforts. The JISPA was first introduced in 1993 with funding from the Government of Japan and is administered by the IMF. Its objective is to contribute to institutional capacity building in economic policymaking to promote the sustainable growth of emerging and developing economies in Asia and the Pacific. 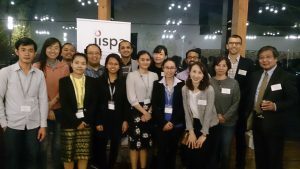 As GraSPP is one of the partnership universities of the JISPA, Prof. Toshiro Nishizawa was invited to serve as the moderator at the Meeting.